During the period of Allied strategic decisions, reorganization, and accumulation of force which characterized the transition from Operation TORCH to the Allied offensives in March, the Allied Force was sparring for advantage with the Fifth Panzer Army. Each side sought to improve its positions and to seize the initiative. Headquarters, II Corps, opened in Constantine during the first week of January and, as already noted, first prepared to direct Operation SATIN, for the seizure of Sfax.4 The force under its command, as contemplated on 12 January, was to consist of the U.S. 1st Armored Division (Maj. Gen. Orlando Ward) with the 26th Combat Team (Col. Alexander N. Stark, Jr.) of the 1st Infantry Division attached, the 1st British Parachute Brigade (less one battalion) for an airborne mission, and the French Constantine Division, plus corps troops.5 Combat Command B, U.S. 1st Armored Division, passed to General Robinett's control with the return of General Oliver to the United States to take a divisional command. Combat Command B, after commitment under British 5 Corps, reverted to General Ward's control on 7 January and, beginning next day moved to Sbeïtla for participation in the impending French-American attack to regain Fondouk el Aouareb gap and perhaps for flank protection during Operation SATIN. the armored division was brought to Tunisia from Morocco in two sections: A provisional battalion under Maj. Werner L. Larson in January; and the remainder of the 443d Coast Artillery (AA) Battalion (SP) under Lt. Col. John C. Smith in February. Although the multiple weapons on halftracks, each mounting a 37-mm. gun and two air-cooled .50-caliber machine guns, could be used in an antitank role, it was possible only by placing the vehicles down a forward slope, or with their front wheels in a ditch. As antiaircraft weapons, they were destined to reduce the losses from enemy dive bombing appreciably. As if to confirm the wisdom of the Allies decision to abandon an attack against Sfax, the enemy on 18 January began an operation to obtain control over Djebel Mansour (678) and over the main source of the water supply for Tunis--the great reservoir and dam on the Kebir river (Barrage de l'Oued Kebir) about twelve miles southwest of Pont-du-Fahs. Another purpose of his attack was to drive the French from the Eastern Dorsal near Kairouan between the reservoir and Kairouan pass. Move your command, i. e., the walking boys, pop guns, Baker's outfit and the outfit which is the reverse of Baker's outfit and the big fellows to M, which is due north of where you are now, as soon as possible. Have your boss report to the French gentleman whose name begins with J at a place which begins with D which is five grid squares to the left of M. Further, CC/B will enter Corps Command net not later than 0900 hours, 20 January. CC/B will remain in contact with SATIN Force at Tébessa. Late that day, II Corps asked Robinett what reinforcements, if any, he would need to carry out the mission given him by General Deligne. In reply he gave his estimate of the forces opposing his command--one battalion of infantry, two companies of tanks, four 88-mm. guns, and three or four batteries of howitzers of at least 105-mm.--against which he had disposed one battalion of armored infantry, one battalion of thirty operational medium tanks, nine self-propelled and six towed 105-mm. howitzers, twelve 75-mm. tank destroyers, and a battery of 40-mm. antiaircraft weapons. The enemy had succeeded in placing his artillery on high ground along the eastern edge of the valley. Robinett therefore reported that any attack whatever northward over the floor of the valley would be unduly hazardous until infantry could engage the enemy in the eastern hills and prevent the flanking fire which might otherwise be expected. To clear the valley, he estimated necessary reinforcements as two battalions of infantry, one battalion of field artillery, and one company of tank destroyers, as well as indirect assistance from an anticipated strong push from the west into the valley by British units. Elements of the 1st Infantry Division were already being sent from Guelma in Algeria via Maktar to the Ousseltia valley sector in order to take over part of the Allied line formerly held by the French, after Combat Command B should have restored the situation. General Fredendall expected, in the light of decisions taken at a command conference at AFHQ Advance Command Post on 21 January, that his zone was to be extended northward and that these troops would be controlled by II Corps. He expected to command them directly, and to have them operate under Col. D'Alary Fechet, regimental commander of the 16th Infantry, in co-ordination with Robinett's forces rather than under Robinett's command, while the latter was withdrawing. Fredendall instructed Robinett to discontinue his attack northward, the operation which General Deligne had ordered, and instead to hold Combat Command B near Ousseltia village on the defensive. Robinett's command was still attached to French XIX Corps and under orders by General Deligne to carry out the offensive, orders he was unable to execute without the reinforcements which, upon arrival would be operating, as just stated, only in co-ordination with Combat Comand B, rather than under attachment to it. While Lt. Col. Russell F.
Akers, Jr., an Assistant G-3 of II Corps, attempted to straighten out this tangle, Robinett's force held its positions. As the night of 22-23 January passed, persistent efforts to get Allied aviation to furnish a controlled air support mission next day finally proved successful. The request was approved about 1000, 23 January, for execution at 1230. When the planes arrived, one smoke shell was placed on the target, which then came under accurate bombing. Damage included the destruction of two enemy trucks loaded with ammunition. 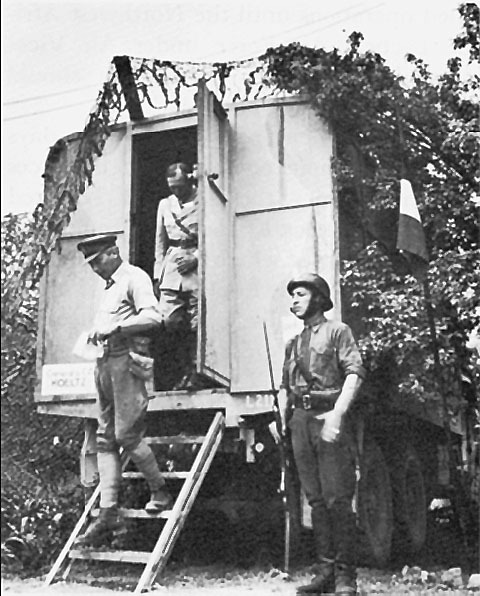 During the bombing and a subsequent artillery shelling, a truckload of American prisoners of war was able to scatter, and later to infiltrate back to their own lines after darkness. But with its mission and command relations uncertain, Combat Command B lost the opportunity to follow up with an attack to seize the area. The first elements of the U.S. 1st Infantry Division began arriving before the end of the day, too late to organize an attack for 24 January. They were attached by II Corps to Combat Command B. The principal unit for commitment toward Kairouan pass was the 26th Infantry Combat Team (less 3d Battalion) commanded by Colonel Stark, which included the 33d Field Artillery Battalion. The 7th Field Artillery Battalion also supported an attack begun by Colonel Stark's force at 0900, 25 January. By that time, Weber's force started its withdrawal, leaving the newly established main line of resistance across the northern end of the Ousseltia valley and along the eastern edge to Djebel Ousselat to be defended by an Italian force consisting of elements of the 1st (Superga) Division and Group Benigni. Stark's attack first encountered about noon a battalion of Italian infantry which had been recruited in Tunisia, drove it back, and continued advancing through the following night. By the next morning, it had gained the western end of the OusseltiañKairouan pass and had come up against a German unit. Its offensive continued during the next two days. would be necessary to reinforce their sector with U.S. and British units until their equipment could be brought up to modern standards. The enemy's attack from Pont-du-Fahs to Ousseltia in the week following 18 January had far-reaching consequences. It did not, as was once supposed, cause the cancellation of Operation SATIN, for as already pointed out, that decision had been made by General Eisenhower at Casablanca.23 But it did bring an end, after less than four weeks, to the period of national commands by the British First Army, American II Corps, and French XIX Corps, each directly under General Eisenhower. LT. GEN. K. A. N. ANDERSON leaving the command post of Gen. Louis Koeltz, Tunisia. To re-establish your central forces on the general line: FONDOUK [el Aouareb]--eastern exit of the pass east of OUSSELTIA--the terrain feature DJ BOU DABOUSS (0-85)--road junction 7 miles northeast of ROBAA [Rebaa Oulad Yahia]-ROU ARADA. As soon as you have accomplished a, to seize and hold the eastern exits of the passes along the general line: EL GUETTARñMAKNASSY-FAID-FONDOUK. To protect your right (south) flank with particular attention to the air bases in the TEBESSA area. In this connection, I deem it essential that you keep the bulk of the 1st Armored Division well concentrated, so as to be prepared to take advantage of any opportunity the enemy may offer to act aggressively as well as to counter strongly any enemy thrust that may develop. The command arrangements arrived at by you in conferences with General Juin to meet the situation resulting from the enemy breakthrough in the area of the DORSALE ridge are confirmed. Under these arrangements you are given command of all Allied forces on the TUNISIAN front, including, in addition to the troops presently assigned to the First Army, the II Corps (U.S.), and a Composite Corps (French and U.S.). The Composite Corps will consist ultimately of the 34th Division (less detachments) and certain French elements now in the OUSSELTIA area, all under a French corps commander. I know that you will be fully sympathetic with the efforts of General Juin to conserve the French forces and uphold the honor of France, and that you will always welcome him at your headquarters and at the front, and afford him every facility which will contribute to that end. 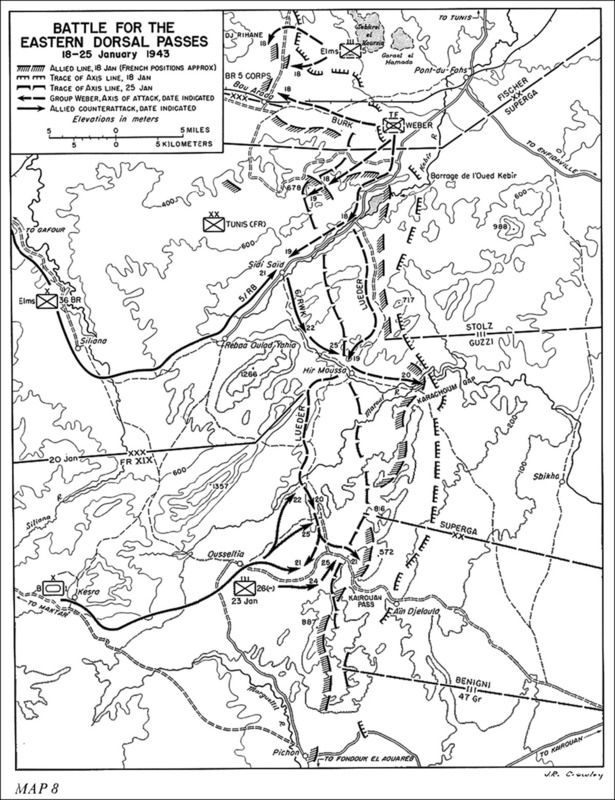 The regroupment of your forces incident to the above will envisage the relief of all elements of the 1st Division (U.S.) and their movement to an assembly area in the vicinity of GUELMA, where it will later pass to your control prior to the attack. To this end, it is contemplated that the 168th CT (U.S.) will be made available to you for the relief of the 26th RCT (U.S.). You are to bear in mind always that all operations now to be undertaken are for the purpose of facilitating the launching of a powerful coordinated attack as soon as the weather will permit and the necessary forces and supplies can be assembled in position. In this latter interest we must look well to the security of lines of communication and to increasing by every possible means the daily delivery of supplies in the forward area. For your information, the Allied Air Force is being directed to continue to pound Rommel's line of retreat including his critical ports so as to hamper to the utmost his withdrawal. To protect the airfields at SOUK EL KHEMIS, TEBESSA, and THELEPTE. . . so that our air forces may operate continuously from them; and to secure the defiles at MEDJEZ EL BAB and BOU ARADA which First Army will require when, in conjunction with Eighth Army, the offensive against the enemy in Tunisia begins. to secure the defiles at present held by the enemy which will improve our position when the offensive begins. to interfere with the enemy's lines of communication in the coastal plain. In undertaking minor offensive operations, you are to consider the effect upon morale of costly failures. Sufficient means should be assembled to give reasonable assurances of success. In the execution of the above mission, I deem it essential that your mobile striking forces in the south be held well concentrated so as to strike en masse when the need arises. In the struggle for the advantages of position and initiative prior to 29 January 1943, the enemy had gained the larger measure of success. In northern Tunisia, he retained his positions guarding the routes to Bizerte and Tunis. Farther south, he controlled all the important passes giving access to the coastal plain in the vicinity of Kairouan. His thrust from the north into the Ousseltia valley had forestalled an Allied operation to recover the gap at Fondouk el Aouareb. To protect the line of communications along the coast from Tunis toward Tripoli, which had just become the only source of supplies for Rommel's army approaching the Mareth Position, the enemy next planned to take control of the routes by which the Allies in central Tunisia could attempt a disrupting attack and subsequently destroy the American forces in the Tébessa area. To facilitate this task Comando Supremo on 28 January ordered the Fifth Panzer Army to take offensive action at three points--the Rebaa Oulad Yahia valley, the pass through the Eastern Dorsal at Faïd, and the road center and oasis of Gafsa.33 Preparations for an attack at Faïd pass were already far advanced. specifically ordered by General Eisenhower, was postponed until after all elements of the 1st Armored Division had had a taste of combat. Faïd pass is a broad opening between Djebel Sidi Khalif (705) on the north and Djebel Bou Dzer (473) on the south through which ran the main tarmac highway from Sfax to Sbeïtla, and beyond. There were two other gaps in the Eastern Dorsal, which were crossed by inferior roads or trails. The first, about six miles north of Faïd pass, near Sidi Khalif, the other just south of Djebel Bou Dzer at Aïn Rebaou. A detachment of about 1,000 men from General Welvert's Constantine Division defended these passes under command of Brigadier General Schwartz. An attacking force, immediately after passing through Faïd defile on an approach from the coastal plain, would find, one mile to the southwest, the village of Faïd, a small collection of block-shaped, white masonry houses. The road forked at this village, the main road leading seven miles straight across the level plain to Poste de Lessouda while a secondary road ran west-southwest for eight miles to Sidi Bou Zid. Just to the north of Poste de Lessouda is the isolated hill mass of Djebel Lessouda (644) a bold butte with excellent observation over the wide stretches of plain which encircle it. Well to the southwest are a series of similar hills of which Djebel Ksaïra (560), near Aïn Rebaou pass, and Djebel Garet Hadid (620), west of Djebel Ksaïra, are prominent. Sidi Bou Zid's dark evergreens and gleaming white low buildings are about five miles south of Djebel Lessouda and four miles north-northwest of Djebel Garet Hadid. Geometric patterns of cultivated fields and orchards are adjacent to bright stuccoed buildings. Elsewhere are the irregular extensive fields of cactus and thin grass which grow generally without the benefit of irrigation. Here was the area in which the U.S. II Corps was to meet its first true challenge. American efforts to relieve the French in Faïd pass on 31 January were not successful. The enemy during the preceding night had emplaced and concealed his antitank and heavy machine guns, mortars, and artillery, and had put many of his tanks in defiladed positions. The American infantry, after making a limited penetration into the lower foothills north of Faïd pass, was repulsed by a thick curtain of fire. The medium tanks of Company H, U.S. 1st Armored Regiment, were lured within range of well-sited antitank weapons which destroyed at least eight vehicles. The American supporting artillery came under long-range counterbattery fire and was also heavily attacked by dive bombers. The southern force was delayed by enemy aviation and then driven back by the enemy ground troops. By 1400 on 31 January the enemy had succeeded in capturing Faïd pass. The American attack not only failed to relieve the French, but also, through absence of Allied air support, failed to prevent the enemy from bringing up reinforcements. The Germans were now firmly established on the Eastern Dorsal from Djebel Sidi Khalif to Maïzila pass where they had gained a foothold south and west of that gap. At 0930 on 1 February Giraud called General Welvert's headquarters ordering that a strong protest be made to General Fredendall regarding the slowness of American intervention and ineffectiveness of U.S. air and artillery. But by 1 February the French in the pass could not be relieved nor Allied possession restored.45 Nevertheless, efforts to drive out the enemy were not abandoned. McQuillin acknowledged candidly at the end of the day that he had failed to accomplish his mission. He pointed out that his right wing had been stopped and the infantry on the left had been driven back "in disorder" from a point close to the enemy's positions by the sudden attack of nine or more Mark IV tanks which had emerged from concealment. While these enemy tanks were being driven back by four American self-propelled 75-mm. guns, by tanks, and by tank destroyers, and pursued until they reached the cover of German antitank guns, the disorganized infantry had been able to withdraw. valley to pull back in order to avoid being cut off, but on 31 January the armored force was repulsed short of Rebaa Oulad Yahia at Sidi Saïd by the British 36th Brigade (with the 2d Battalion, U.S. 16th Infantry, attached). Although the enemy broke off the attack that evening, his threat brought Combat Command B, U.S. 1st Armored Division, hurrying back from the area southeast of Tébessa to which it had so recently been recalled from the Ousseltia valley. It spent 1 February at Hadjeb el Aïoun, and during the next night continued to its new station in the vicinity of Maktar, out of II Corps' area and in First Army reserve. 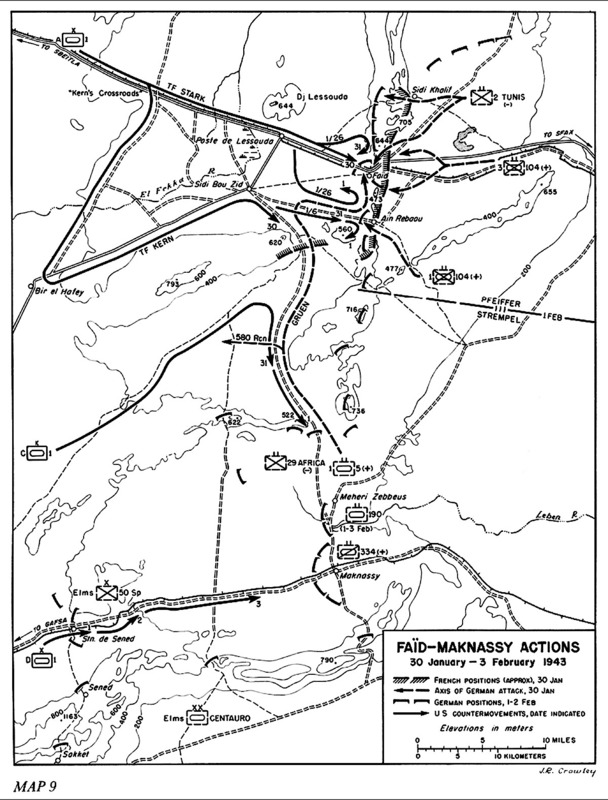 While the enemy's initiative southwest of Pont-du-Fahs and at Faïd pass drew Allied forces into containing positions, the operations by II Corps to seize Maknassy came to an end. Meanwhile, Colonel Maraist's force, called Combat Command D, led by elements of the 81st Reconnaissance Battalion, marched on Station de Sened from Gafsa early on 31 January.55 The reconnaissance force slipped around Station de Sened to occupy high ground east of it. The infantry was ordered to move in trucks cross country on a wide front to a point about ten miles west of the objective, then to detruck and proceed on foot, attacking from the south with two companies abreast and a third echeloned to the right rear. The tanks were to approach parallel to the road but were to bypass the objective on the north and turn in order to strike from the east. The artillery was to support the attack from positions northwest of the hamlet. the position was threatened, the enemy reacted quickly by sending reinforcements from Gabès.58 In a slow attack on 1 February, the Americans finally penetrated the hamlet about 1640, held the town during the night, and prepared to continue the advance next morning to the east, where stronger enemy forces had assembled. The attack toward Maknassy was renewed at daylight on 3 February with tanks, tank destroyers, and assault guns out in front of the infantry line to repel any counterattack by Axis forces. Well forward was the reconnaissance unit of 701st Tank Destroyer Battalion, which got within six miles of Maknassy by noon. Artillery fired on elusive enemy detachments, and fifteen American B-25's bombed enemy tanks near Maknassy at about 1530 and Station de Sened (in American possession) by mistake soon afterward. At this juncture, Maraist's attack on Maknassy from the west was broken off when orders from II Corps' advanced command post were received directing Combat Command D's withdrawal at 1830 to Gafsa. The move was completed before daylight. chain. At Maktar, in First Army reserve was Combat Command B, still withdrawn from General Ward's control.66 Near Hadjeb el Aïoun, was Combat Command C, only nominally under division control and directed by II Corps to cover the twenty-mile zone from north of Djebel Trozza to a screening ridge southeast of Hadjeb el Aïoun. Combat Command A covered the rest of the chain of mountains as far as Djebel Meloussi, west of Maïzila pass. At First Army's insistence Combat Command D was recalled from its operation toward Maknassy in order to enter II Corps Reserve at Bou Chebka in place of Combat Command B. The 81st Reconnaissance Battalion (less Company B) went into 1st Armored Division Reserve at Sbeïtla. The 168th Infantry (less 1st Battalion) was also to pass to direct corps control and to move from Gafsa to Sbeïtla and thence to Sidi Bou Zid. The 1st Battalion, 168th Infantry, went into II Corps Reserve at Fériana. Greater mobility in the northern sector was accomplished by the improvement of a road from Hadjeb el Aïoun to El Ala, a project carried through by Company B, 16th Armored Engineer Battalion, and units from the U.S. 34th Division. SUBJECT: Defense of FAÏD Position. TO: Commanding General, 1st Armored division. held, with a mobile reserve in the vicinity of SIDI BOU ZID which can rapidly launch a counter attack. Plans for all possible uses of this reserve should be prepared ahead of time. A battalion of infantry should be employed for the defense of DJ. KSAIRA, and the bulk of a battalion of infantry together with a battery of artillery and a company of tanks for the defense of DJ. LESSOUDA. Remainder of artillery is at present satisfactorily located. It should, however, furnish its own local protection, and be prepared to shift rapidly. 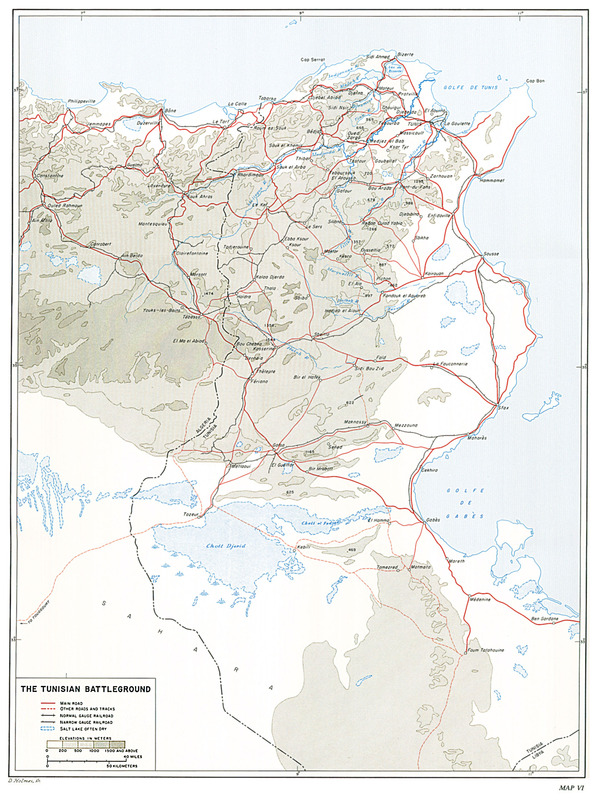 Additional Reserves: The 1st Battalion, 6th Infantry, now under your control, should immediately send a liaison officer to Hq., CC A. Inasmuch as this Battalion will likely be employed by McQuillin should an attack in the FAÏD area develop, the Battalion Commander, in collaboration with McQuillin should prepare plans for the use of his Battalion. These plans should ensure rapid movement and employment of this Battalion once it has been ordered. Reconnaissance: It is extremely important that reconnaissance and counter reconnaissance be conducted by you from HADJEB EL AIOUN on the North to the pass between DJ. MAIZTLA [Djebel Maïzila] and DJ. GOULEB on the South. In this area strong listening posts should be established 24 hours a day from which raids, when appropriate, can be conducted. It is essential that this reconnaissance and counter reconnaissance link up with that now being conducted by the 1st British Derbyshire Yeomanry. The force now at McQuillin's disposal is not sufficient for the area for which he is responsible. The bulk of your 81st Reconnaissance Battalion should be used in the area HADJEB EL AIOUN-MAIZTLA-GOULEB PASS. Patrols: It is vital that strong infantry foot patrols be sent forward at night from DJ. LESSOUDA and DJ. KSAIRA. These patrols must be offensive. They must keep track of the enemy's strength and organization. They should be especially watchful for any attempt of the enemy to debouch from the passes at night. They must take prisoners. It is also important that these patrols locate the presence of minefields, if any, in areas like the gap between DJ. RECHAIB and DJ. BOU DZEL [Djebel Bou Dzer]. The latter would, of course, be of great importance in the event we decide to capture FAÏD. Use of Wire, AT Mines, Trip Wire, etc: I desire that you make maximum use of all available means to strengthen the positions outlined above. The necessary matériel is available and should be used immediately. Photography: I have instructed my G-2 to furnish you as soon as possible a photographic strip covering the area: Pass at T8358ñFAÏD PASS-REBOU [Aïn Rebaoul]ñMATLEG PASS. I have asked that every effort be made to secure good pictures of the Pass at T8358, FAÏD PASS, and MATLEG PASS. I desire that a copy of this directive, together with your own comments, be sent to McQuillin. You will inform me when the instructions enumerated in this directive have been complied with. In other words I want a very strong active defense and not just a passive one. The enemy must be harassed at every opportunity. Reconnaissance must never be relaxed--especially at night. Positions indicated must be wired and mined now. The note of hopefulness with which January had opened, and the high expectation of II Corps of carrying the battle to the enemy, had led early in February to temporary frustration.69 The enemy was still calling the tune. Until the Allies were strong enough to resume the offensive in March, they would have to fight the enemy where he chose to attack, and when. 1. Info supplied by Cabinet Office, London. 2. MS # T-3 (Nehring et al. ), Pt. 3a. 3. (1) Giraud Hq, Rapport des opérations, pp. 34-35. (2) Gen Mathenet, Rpt of 1st Moroccan Div Opns. 27-30 Dec 42, and Comments by Gen Jurion, Deputy Comdr CSTT, in CSTT Jnl, 30 Dec 42; see also same jnl, 26-30 Dec 42, 11-15 Jan 43. (3) XIX Corps Jnl, 6-15 Jan 43. (4) Journal de Marche de la Division de Marche d'Alger (hereafter cited as DMA Jnl), 7-15 Jan 43. (5) Phone Msg, XIX Corps to G-2 AFHQ, 1830, 3 Jan 43; Msg, Liaison Officer First Army to AFHQ, 4 Jan 43. AFHQ G-3 Ops 22/6, Micro Job 10A, Reel 5C. (6) Fifth Panzer Army, KTB III, 3 Jan 43. 4. General Fredendall's staff was headed by the following: Chief of Staff, Col. John A. Dabney; G-1, Lt. Col. Lon H. Smith; G-2, Col. B. A. Dickson: G-3, Col. Robert A. Hewitt; and G-4, Col. Robert W. Wilson. Other staff officers of Center Task Force had been reassigned to AFHQ, First Army, or the War Department. 5. Msg, Eisenhower to CCS, 12 Jan 43. 6. (1) II Corps AAR, 2 May 43: 1st Armd Div G-3 Rpt 22; 26th Inf AAR. (2) Ltr, Lt Col Werner L. Larson to author, 27 Mar 51, with incl, Hist Rpt of 443d CA (AA) Bn (SP). (3) Info supplied by Cabinet Office, London. 7. FO, Fifth Panzer Army, 14 Jan 43, in 334th Inf Div, Ia, Anlagen zum KTB Nr. 1, Unternehmen Eilbote I , 13.-25.I.43 (cited hereafter as 334th Inf Div, In, KTB Anlagen, File Eilbote I). 8. FO, Kampfgruppe Weber, 17 Jan 43, in 334th lnf Div, Ia, KTB Anlagen, File Eilbote I. 9. (1) Fifth Panzer Army, KTB III, 13-21 Jan 43. (2) AAR, Kampfgruppe Weber, in 334th Inf Div, Ia, KTB Anlagen, File Eilbote I. (3) MS # T-3 (Nehring et al. ), Pt. 3a. 10. (1) 334th Inf Div, Ia, KTB Anlagen, File Eilbote I. (2) AAR, 501st Heavy Panzer Bn, in Fifth Panzer Army, Anlagen zum KTB III A, 2.-31.I.43. 11. (1) Giraud Hq, Rapport des opérations. pp. 35-37. (2) Info supplied by Cabinet Office, London. 12. (1) CCB 1st Armd Div AAR, 19-29 Jan 43, 12 Feb 43. (2) The components of Combat Command B on 19 January 1943 were: Headquarters Company, Reconnaissance Company, Service Company (less detachment), and 2d Battalion, 13th Armored Regiment (mediums); 2d Battalion, 6th Armored Infantry Regiment; 27th Field Artillery Battalion; 601st Tank Destroyer Battalion (less Company A); Company B, 16th Armored Engineer Battalion (C); Company N, 47th Medical Battalion; Battery D, 106th Coast Artillery (AA) Battalion; and Company C, Maintenance Battalion, 1st Armored Division. 13. (1) Dir, Truscott to Anderson, Juin, and Fredendall, 1200, 20 Jan 43. AFHQ G-3 Ops 22/2. Micro Job 10A, Reel 5C. (2) II Corps AAR, 2 May 43. (3) Msg 6436, Algiers to Atlantic Base Section (SAL), 1752, 20 Jan 43, AFHQ CofS Cable Log. 14. CCB 1st Armd Div AAR, 19-29 Jan 43, 12 Feb 43. 15. 334th Inf Div, Ia, KTB Anlagen, File Eilbote I. (2) XIX Corps Jnl, 19-21 Jan 43. 16. Info supplied by Cabinet Office, London. 17. (1) DMA Jnl, pp. 20-21, 21 Jan 43. (2) 601st TD Bn AAR, 28 Feb 43. (3) Msg 138, Adv CP to AFHQ, 21 Jan 43. AFHQ CofS Cable Log, 199. (4) XIX Corps Jnl, 21-22 Jan 43. 18. (1) 334th Inf Div, Ia, KTB Anlagen, File Eilbote I. (2) CCB 1st Armd Div AAR, 19-29 Jan 43, 12 Feb 43; Chronological Sequence of Events in the Ousseltia Valley Campaign, 10 Feb 43, in 1st Armd Div Hist Rcds, Vol II. 19. (1) CCB, 1st Armd Div AAR, 19-29 Jan 43; Chronological Sequence of Events in Ousseltia Valley Campaign, 10 Feb 43, in 1st Armd Div, Hist Rcds, Vol. II. (2) XIX Corps, Jnl, 23-27 Jan 43. (3) Info supplied by Cabinet Office, London. (4) 601st TD Bn AAR, 28 Feb 43; 26th Inf AAR, 25-28 Jan 43, 23 Apr 43. 20. (1) Msg N22/29, Adv CP AFHQ to AFHQ, 30 Jan 43, AFHQ CofS Cable Log, 272. (2) Ltr, Gen Allen to CinC AF, 7 Feb 43. AFHQ G-3 Ops 22/2, Micro Job 10A, Reel 5C. (3) 3d Bn 16th Inf Battle Rpt, 8 Mar 43; CCB 1st Armd Div AAR, 19-29 Jan 43, 12 Feb 43. (4) XIX Corps Jnl, 24 Jan 43. 21. 334th Inf Div, Ia, KTB Anlagen, File Eilbote I. 22. CCB 1st Armd Div Intell Rpt, 21-28 Jan 43. 23. II Corps AAR, 3 May 43. 24. (1) CinC AF Diary, 21 Jan 43. (2) Eisenhower, Crusade in Europe, p. 127. (3) Msg 6436, AFHQ to Atlantic Base Section (SAL), 1752, 20 Jan 43, AFHQ CofS Cable Log. 25. Info supplied by Cabinet Office, London. 26. (1) Despatch, Lt Gen K. A. N. Anderson, p. 8. OCMH. (2) Memo, Deputy CofS AFHQ (Truscott), for CC's of First Army, II Corps, and 1st Inf Div, 24 Jan 43, sub: Attachment of Amer troops to Br. First Army. AFHQ Micro Job 10A, Reel 5C. 28. II Corps AAR, 2 May 43. 29. (1) First Army Opns Instruc 11, 26 Jan 43. DRB AGO. (2) Fredendall and Juin agreed that Fondouk el Aouareb should be within II Corps' area in a conference at Tébessa on 27 January 1943, reported via AFCP to AFHQ and First Army in Msg 94/27, 28 Jan 43. AFHQ CofS Cable Log, p. 257. 30. (1) Giraud Hq, Rapport des opérations, p. 39. (2) First Army Opns Instruc 11, 26 Jan 43. DRB AGO. 31. (1) Ltr, Eisenhower to Anderson, 11 Feb 43. AFHQ G-3 Ops 58/2.1, Micro Job 10C, Reel 188D. (2) In addition to Combat Team 18 (strength approximately 4,500), First Army had under command 62,456 British officers and enlisted men on 27 January 1943. Q (Maint) Tab Rpt of Admin Sitrep 10, 1800, 27 Jan 43. AFHQ CofS Cable Log. 32. Memo, Brig J. F. M. Whiteley for Gen Rooks, 22 Jan 43; Memo, Rooks to Whiteley, 22 Jan 43; Ltr, CinC AF to CG First Army, 26 Jan 43; Mins of Conf, 1 Feb 43. AFHQ G-3 Ops 58/2.1, Micro Job 10C, Reel 188D. 33. Msg, Cavallero, Comando Supremo (Nr. 027/OP/A) to Fifth Panzer Army, 1830, 28 Jan 43, in Fifth Panzer Army, KTB, Anlagen, g. Kdos. (Chefsachen), 16.I.-26.II.43, Tunesien. 34. Bir Mrabott is about 20 miles southeast of Gafsa on the Gabès road. 35. II Corps FO 1 , 19 Jan 43. (2) II Corps AAR, 3 May 43. 36. Combat Command C for this engagement consisted of: the 6th Armored Infantry (less the 1st and 2d Battalions and Company G); Company C (plus one platoon of Company D), 81st Reconnaissance Battalion; Company I, 13th Armored Regiment; Battery B, 68th Field Artillery Battalion; the 3d Platoon of Company D, 16th Engineer Battalion; the 2d Platoon of Battery B, 443d Coast Artillery (AA) Battalion (SP); and detachments of the 141st Signal Company and 47th Medical Battalion. See 1st Armd Div Opns Instruc 1, 23 Jan 43. 37. 6th Armd Inf AAR, 23 Janñ26 Feb 43. 38. Rpt of Conf, Fredendall and Juin, Tébessa, 27 Jan 43. AFHQ CofS Cable Log, 252. 39. 1st Armd Div FO 3, 30 Jan 43. 40. 21st Panzer Div, Ia, KTBñAnlagen, Nr. 9, 1.I.-3l.III.43, Afrika, (cited hereafter as 21st Panzer Div, KTB Anlagen, Band 9). 41. 21st Panzer Div, FO for the capture of the Faïd strongpoint, 26 Jan 43, ibid. 42. 21st Panzer Div, KTB, 1.I.-31.III.43, 30 Jan 43. 43. 1st Armd Div FO 4, 30 Jan 43. Troops available to Combat Command A were: the 1st Armored Regiment (less the 1st and 2d Battalions); the 1st Battalion, 6th Armored Infantry; the 26th Infantry (less Company C and 2d and 3d Battalions); the 1st Reconnaissance Troop; the 33d Field Artillery Battalion; the 91st Field Artillery Battalion; Company A, 701st Tank Destroyer Battalion; Company C, 16th Armored Combat Engineers; and Battery D (less two platoons), 443d Coast Artillery (AA) Battalion (SP). 44. Info supplied by Gen McQuillin to author. OCMH. The northern group consisted of: the 1st Battalion (-), Headquarters Company, and Cannon, Antitank, and Medical Companies, 26th Infantry: a platoon from the 443d Coast Artillery (AA) Battalion (SP); and Company H, 1st Armored Regiment, with a platoon from 701st Tank Destroyer Battalion attached. The tanks were to leave this force after taking Faïd village in order to attack southward along the mountains to Aïn Rebaou. The southern group included: the 1st Battalion (less Company B), 6th Armored Infantry; Company G and a platoon from Reconnaissance Company, 1st Armored Regiment; Company A (less a platoon), 701st Tank Destroyer Battalion; and one platoon from Company C, 16th Armored Combat Engineers. Battery B, 91st Field Artillery Battalion, was to support from a position east of Djebel Lessouda. CCA 1st Armed Div AAR, 23 Jan-26 Feb 43; 26th Inf AAR, 11 Nov 42. 14 Apr 43, 23 Apr 43. 45. Phone Msg, Gen Giraud to Capt Ciarlet to be transmitted to Gen Fredendall et al., 1 Feb 43, in DMC Jnl, 1 Feb 43. 46. Combat Command C, 1st Armored Division, on 30 January 1943 consisted of: the 6th Armored Infantry (less the 1st and 2d Battalion); Company B (plus 2d Platoon, Company D), 81st Reconnaissance Battalion ; Battery C, 68th Field Artillery Battalion; Company C, 13th Armored Regiment; the 1st Platoon, Company D, 16th Engineers (C); a detachment of Company B, Maintenance Battalion; a detachment of the 47th Medical Battalion; and the 1st Platoon, 443d Coast Artillery (AA) Battalion (SP). 6th Armd Inf AAR, 23 Jan-26 Feb 43. 47. 6th Armd Inf, Rpt of Combat Opns in North Africa, Nov 42-May 43, Pt. II, p. 9. 49. II Corps Sitrep, 1700, 31 Jan 43. 50. DMC Jnl, 31 Jan 43. This contains a special note by General Welvert describing his efforts to co-ordinate American operation at Faïd. 51. (1) CCA 1st Armd Div S-2 Rpt, 1800-2300, 1 Feb 43. (2) 3d Bn 1st Armd Regt AAR, 1 Jan-21 Feb 43, 30 Jul 43. (3) 26th Inf AAR, 23 Apr 43, which reports casualties of ninety wounded and six or seven missing. 52. (1) 6th Armd Inf AAR, 23 Janñ26 Feb 43. (2) Memo, CG CCA to CG 1st Armd Div, in 1st Armd Div Sitrep, 1-2 Feb 43. (3) 1st Armd Div FO 5, 1200, 3 Feb 43. (4) Losses reported by the 26th Infantry were 1 killed and 56 wounded and for 6th Armored Infantry 4 killed and 16 wounded. (5) French losses known on 2 February were 905 officers and men, killed or missing in action. DMC Jnl, 2 Feb 43. (6) The enemy reported capture of 1,047 prisoners of war (mostly French), 25 armored cars, 3 guns, 2 antiaircraft guns, 15 antitank guns, 8 mortars, 57 machine guns, 10 trucks, and 5 aircraft either destroyed or damaged. Msg, OKH/GenStdH/Op Abt, Nr. 1563/43, to army groups, 4 Feb 43, in OKH/GenStdH/Op Abt, File Abendorientierungen Afrika, 1.I-13.V.43. (7) Msg, CG II Corps to CG 1st Armd Div, 1030, 2 Feb 43, in II Corps G-3 Jnl. This message said: "Mission--Contain enemy at Faïd and Fondouk [el Aouareb]. Active defense. Patrolling. Active use of arty fire. Insure no exit by enemy. Notify McQuillin at once." 53. (1) Info supplied by Cabinet Office, London. (2) MC #T-3 (Nehring et al. ), Pt. 3a. (3) Capt. Nigel Nicholson, The Grenadier Guards in the War of 1939-1945 (London, 1949), II, 277. British casualties came to 260, with at least 35 killed and 16 missing. 54. 6th Armd Inf AAR, 23 Janñ26 Feb 43. 55. The force was built around the medium tanks of the 3d Battalion, 13th Armored Regiment, less Company G (Lt. Col. Ben Crosby), the 1st Battalion, 168th Infantry (Lt. Col. John C. Petty), and the 701st Tank Destroyer Battalion, less Companies A and B. The Cannon Company, 39th Infantry; 68th Field Artillery Battalion, less Battery C; Company D, 16th Armored Engineers (C); and one platoon of the 443d Coast Artillery (AA) Battalion (SP) were included. 56. CCD 1st Armd Div Hist Rcds, 1 Mar 43, in 1st Armd Div Hist Rcds, Vol. XI. 57. (1) Memo, H. P. Dittemore for CG 1st Armd Div, 11 Feb 43, sub: Investigation. Copy in possession of Brig Gen Hamilton H. Howze. (2) 175th FA Bn War Diary, 31 Jan-2 Feb 43. (3) Memo, Gen Fredendall for CinC AF, 10 Mar 43, sub: Notes on recent opns on the Tunisian front, par. 8. 58. (1) Memo by Arty and Rcn Survey Officer 1st Armd Div. Copy in OCMH. (2) 21st Panzer Div, KTB, 1.I.-31.III.43, 31 Jan and 1 Feb 43. 59. (1) 1st Armd Div Hist Rcds, Vol. II. (2) Memo by Arty and Rcn Survey Officer. Copy in OCMH. 61. Mins of Conf between Eisenhower and Anderson, Feb 43. AFHQ G-3 Ops 58/2.1, Micro Job 10C, Reel 188D. 62. (1) Memo, Col Thomas D. Drake for ACofS G-2, 14 May 45, sub: Account of 168th Inf opns 24 Dec 42ñ17 Feb 43. DRB AGO. (2) 175th FA Bn War Diary, 31 Janñ2 Feb 43. 63. (1) Casualty List (omitting 81st Rcn Bn after 1 Feb), 5 Feb 43. Copy in 1st Armd Div Hist Rcds, Vol. II. About half the casualties were in the 168th Infantry. (2) General von Arnim considered that when Maraist's attack was called off, all means of defending Maknassy against it had dropped to minor proportions. MS #C-098 (von Arnim). 64. 21st Panzer Div, KTB, 1-3 Feb 43. 66. The British 6th Armoured Division was being rearmed with U.S. Sherman tanks at this time and was not, therefore, used as First Army Reserve. Memo, Eisenhower for the record, 25 Feb 43, in CinC AF Diary, Bk. V, pp. 256a-256e. 67. (1) Msg, Gen Kuter to CinC AF, 6 Feb 43. AFHQ CofS Cable Log 46. (2) A counterattack to be led by General Porter to regain Faïd pass was abandoned on 5 February 1943. He was transferred to AFHQ advanced command post from II Corps. 68. 1st Armd Div Rpt of Opns, 3-18 Feb 1943, 1st Armd Div Hist Rcds, Vol. IV. 69. Operations thus far had cost II Corps 699 casualties only (50 killed, 487 wounded, 152 missing, 10 captured). Msg, 10 Feb 43, Entry 174, II Corps G-3 Jnl.